Its tall dark bell tower stands high above the countryside. 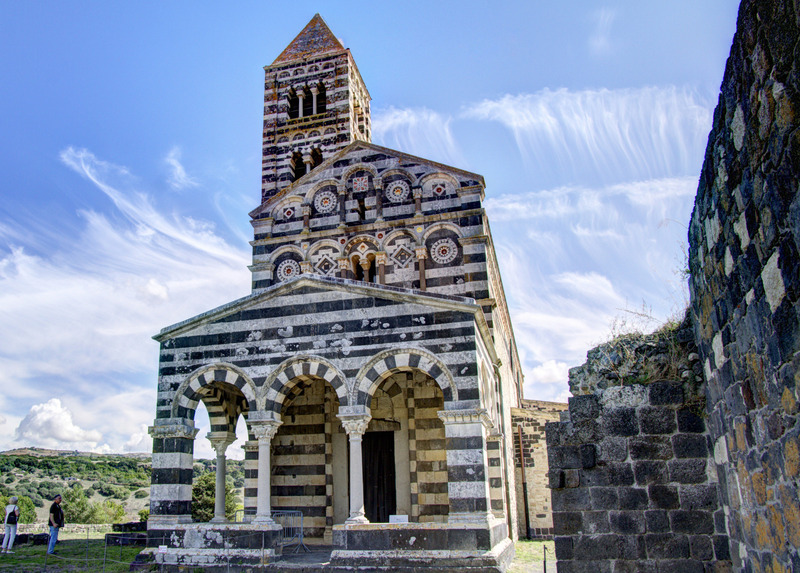 Seeing it is already an emotion, the first taste of what you will feel when you leave the strada statale 131 trunk road to take the Sassari-Olbia road and, a few kilometres later on, you reach the church of Santissima Trinità. You will be struck by its proud perfection and black and white bicolour appearance given by the limestone and basalt ashlars contrasting with the greenery all around. Its majesty has been dominating the plain of Saccargia, in the territory of Codrongianos, since the first decades of the 12th century. The first evidence is in a condaghe, part of the property of the Camaldolese monks. The date of its extension (1116) is indicated in the document: in fact, the church was built on the ruins of a monastery, next to which you will notice some buildings that are still remaining. It is said that s'acca argia would come from the pasture, every day, to offer her milk to the friars and that she would sit down as if in prayer. 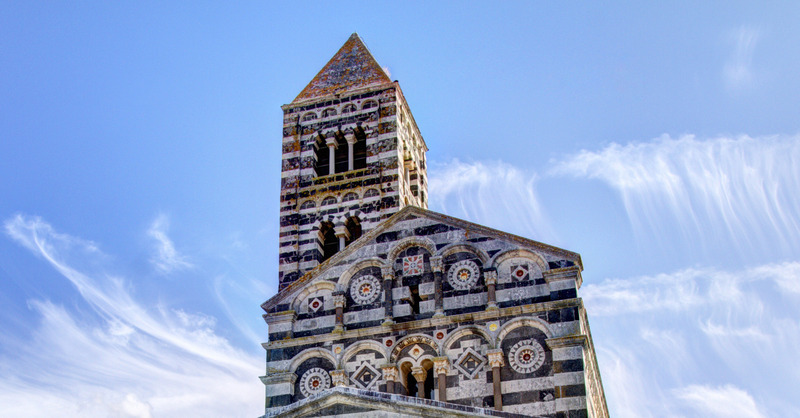 The name of the basilica does not, however, come from the Logudorese expression for 'piebald cow' but from the evolution of the Latin word Sacraria. The plain on which it stands was, in fact, the home of religious cults since prehistoric times. 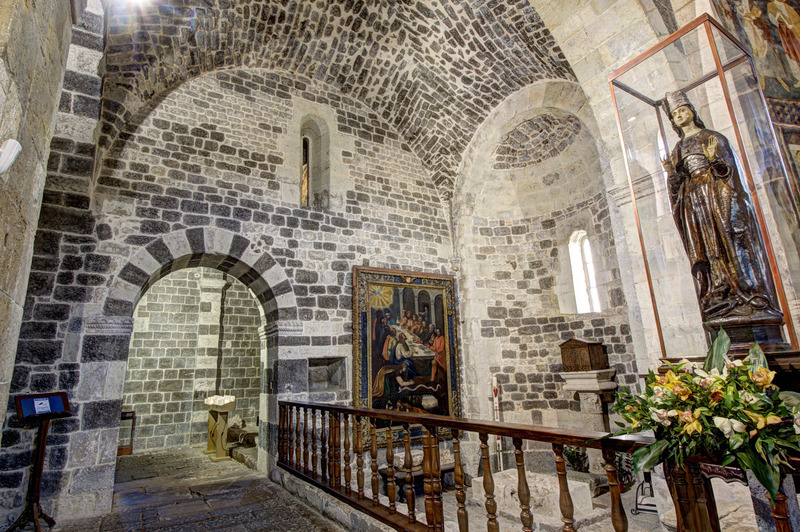 On a pilgrimage to the basilica of San Gavino, in Porto Torres, judge Costantino and his wife Marcusa were said to have spent the night here, as guests of the monks, and following a sacred apparition, they ordered the building of the church, which was named after the Virgin Mary and the Trinity and entrusted to the Camaldolese monks. 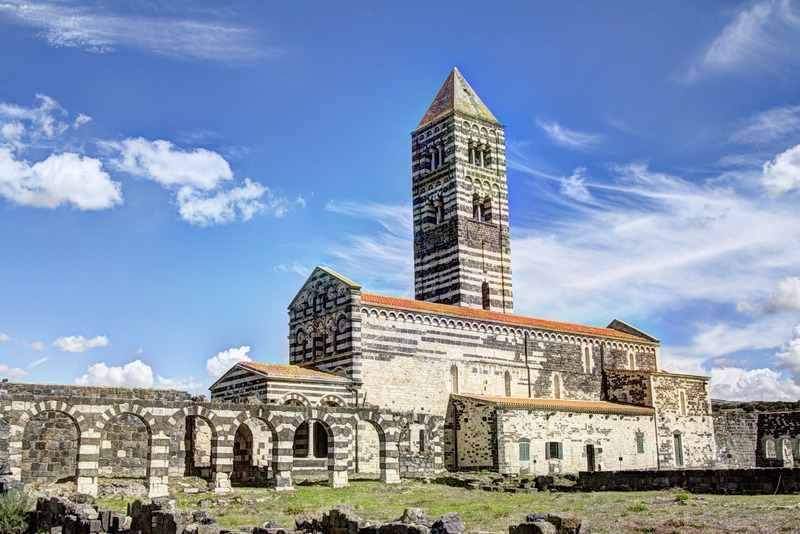 The extension work was entrusted to Pisan workers between 1118 and 1120: lengthening of the hall, raising of the walls, a new façade and a very tall quadrangular bell tower to the northwest. After that time, the appearance was only changed by renovation work at the beginning of the 20th century. 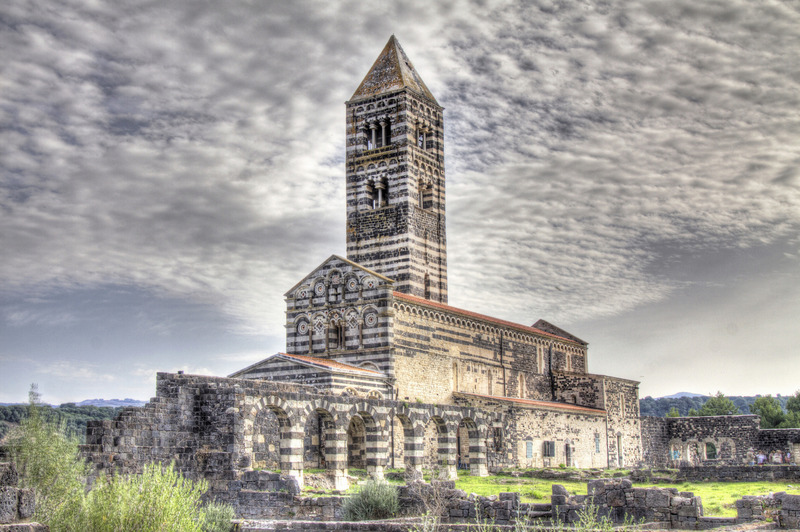 The basilica is twenty metres long, seven wide and 14 tall. It has a Tau cross shape with a single room and a transept. The façade has three orders: in the first, there is a portico with a gabled roof, spaced out over seven arches and with architraves on top. From the nave, through rounded arches, you will enter the wings of the transept, where two cross-vaulted chapels open up. Behind it, there are three apses. 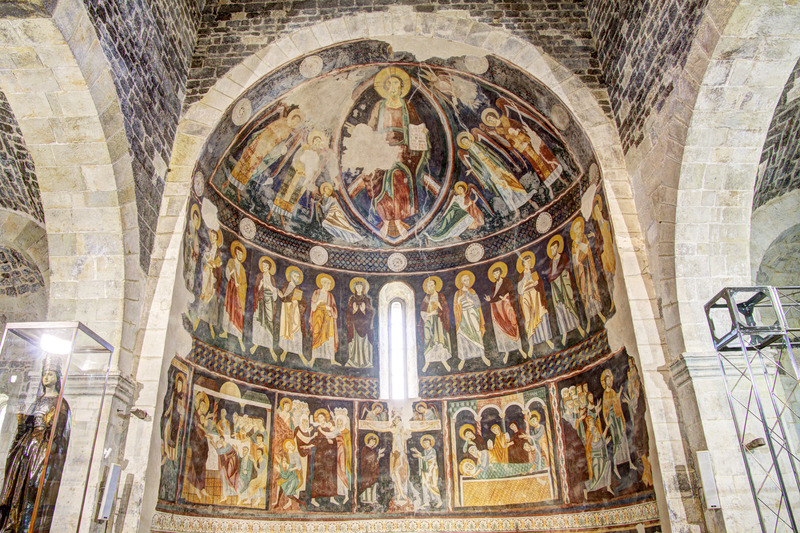 At the end of the 12th century, the internal part of the central apes, which is higher and wider, was frescoed by an artist (maybe) from Umbria-Lazio: it is the only example of Romanesque wall painting in Sardinia. You will admire the series of frescoes: the Christ in mandorla with seraphs, angels and archangels, the Madonna in prayer with saints and scenes of the life of Christ, reminiscent of the coeval paintings of San Pietro in Galtellì. Perché rappresenta il monumento romanico più conosciuto della Sardegna, ancora avvolto nella leggenda della sua fondazione. Partendo da Codrongianos, da via Cagliari procedi verso via XXIV Maggio. Percorri via Sassari poi svolta a destra su via Saccargia. Svolta a sinistra e procedi fino ad avvistare l'alto campanile della chiesa, che svetta sulla campagna circostante. Il sito è indicato da un’apposita cartellonistica. Do you like this place? Alghero and Castelsardo could be your ideal destinations.